Devon (Mr Rodeo) comes to North Cyprus to visit his friends Steve and Denise Bisson and while he is here he takes the opportunity of showing his remarkable country music style at various venues where he is always very warmly received and supported by residents and holidaymakers. This time Devon has given his support to Help Those with Cancer Association (Tulips) and all of his performances will be in aid of that very worthwhile North Cyprus charity. We have seen Devon perform on many occasions and he will be giving his all at Al Shaheen in Karakum on Tuesday 23rd June, where we can assure those attending that they will be in for a great night’s entertainment as well as a choice of meal from Al Shaheen’s delicious a la carte menu. We hope that Steve and Denise, who run the Phoenix Line Dance Club, will be there to support Devon and, if so, I am sure there will be some line dancing to enjoy from Steve, Denise and their friends. 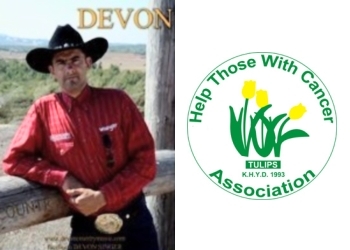 A Tulips representative will be present so Devon hopes that the guests will be generous in supporting Tulips, as he does, with donations to help them to continue with their good work. This entry was posted in Special Events and tagged Al Shaheen Karakum, Devon aka Rodeo Man, Entertainment, Help Those with Cancer Association (Tulips), North Cyprus, Phoenix Line Dancers, TRNC by kyreniacatkin. Bookmark the permalink.